The tour of Tinnkommune continues: a day of traditional textiles and hiking. September 10, 2016. Saturday morning. I usually wake up early (only) when I’m on vacation, but I gave myself permission to sleep in on this lazy morning. I ate my breakfast of unsweetened muesli and fresh berries outside in the cold gray morning air. I added some hot cocoa to the menu for good measure and drank it slowly, gathering strength for another beautiful day of adventures in Tinn. It was forecast to be rather damp with temperatures around 10ºC/50ºF, which I had known ahead of time and so had brought a warm rain-resistant jacket– a recent purchase from my old stand-by, Lands End, and with which I was quite impressed. By 10:00 I had cleaned up and gotten ready for the day. 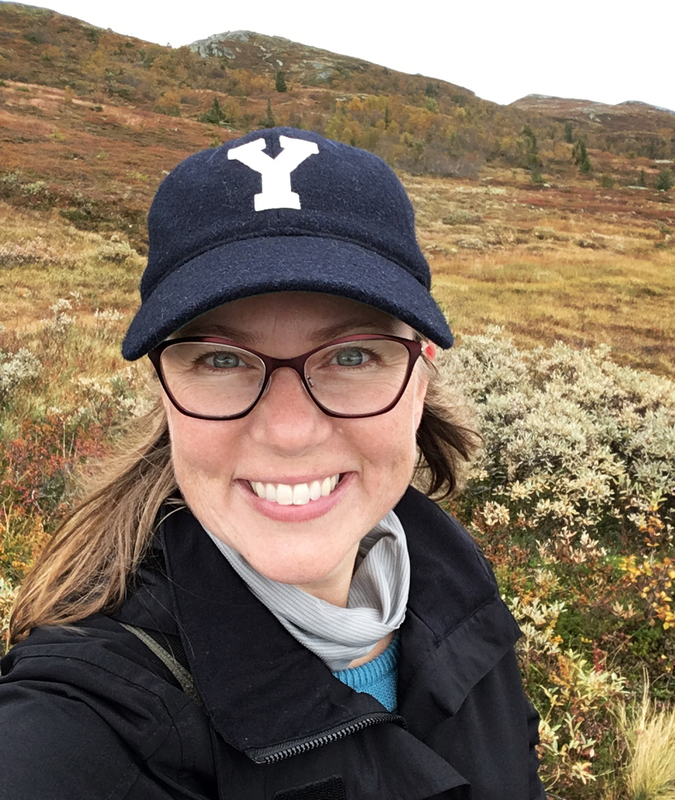 I was anxious to meet a woman with whom I had been communicating on social media: none other than Rena Aandalen. She and I had connected some time ago, and that story is told in the post about rosesaum. I had told her I would be in town and wondered if we could meet up. She said there would be a gathering that Saturday morning for a group of women learning to make the jacket that goes with the skjælestakken bunad- the one that predates the current bunad (national costume) from Tinn. The meeting itself was to be led by one of the women I mentioned in a previous post- one of those for whom I had no contact information, only that she was on the list of those who were resident pros. The stars all aligned and, with a sense of grateful awe and slight nervousness, I drove from my warm and cozy cabin over to the community house to glean anything I could from the masters at work. Rena was more than generous; she and I had our own meeting to the side of the jacket lesson that was going on. She had anticipated many of my questions; she brought examples of the rosesaum she was working on, samples of the wool yarn/thread she uses, giant bolts of fabric from which she cut sufficient yardage of black and green wool for me to make another bunad, including the difficult-to-find black jacquard apron fabric (and for which I paid her 1200kr for all three pieces together via PayPal when I got home), and books to show me. With a mix of my Norwegian and her English, we discussed the process of making a Tinnbunad. She answered every question about technique, material, timing, style variations, color variations, sewing details and finished form. I brought my pattern with me and she helped me answer a couple of questions about it and gave me an invaluable template for making the embroidery pattern. My rosesaum and other Tinnbunad posts will have to be updated soon…. Work in progress by Rena Aandalen. Nice use of blues! More than a few mysteries were solved and I feel slightly better prepared to take on the process of making a more correct version sometime soon. (Like, before I forget what my notes say.) I was able to take a video of her sewing, then she let me try and helped me see how to make the stitches I had been looking at so closely for the last year. I was so excited to be able to talk to her about all of this! I asked her about how she started- a course back in the 80’s, she said. (She must have been very young.) She laughed about how her work back then compares to what she can do now, and it gave me hope. We spent a koselig hour and a half together, then the meeting wound down and I told her how grateful I was to have been able to meet her and for all the help she was willing to give me so freely. Walking out into the dreary gray midday, I was filled with warmth. Well, THAT was a dream come true! It seemed like I was saying that every day now. I put all the materials and my notebook in the trunk of the car and headed west into Rjukan (RYOO-kahn). The town is in a narrow valley just north of a giant mountain named Gaustatoppen. The tops of all the local peaks were shrouded in misty clouds the day I visited so my pictures of the famous landmarks are somewhat incomplete, but I enjoyed driving around and getting to know the town. It had grown up during the first half of the 20th century and has an Industrial Workers’ Museum. There are a couple of movies and books about the sabotage of the heavy water plant that occurred at Vemork in 1943. It’s an impressive story. Another notable fact about Rjukan is that the valley gets no direct sunlight between October and March. That problem was addressed a few years ago when 3 giant sun mirrors were built to reflect sunlight into the town square. You can see the news reports in English and Norwegian. It was a pretty exciting event! Anyway, I drove through the town and dropped off a note to Else Ohren with whom I was unable to meet that day, but who had contributed so much to my understanding of the Tinnbunad. I hope to catch her next time. My next stop was high above the town- the parking lot for the Krossobanen, or cable car which carries ticket-holders up the mountainside to the Gvepseborg area and the start of several hiking trails. I donned my hat, waterproof trousers and hiking boots, made sure I had a water bottle and a couple of snacks, and headed up, up, and away. Despite the wet and windy conditions, there were plenty of hiking groups around. “Friluftsliv”, or “fresh-air life”, is another essential part of the Norwegian identity. EVERYONE hikes- at least now and then. Some do it quite often. There are plenty of technically difficult hikes in Norway, but there are also a lot of easy trails around. Plenty of Norway’s mountains and highlands are relatively flat on top and the area above Rjukan has a trail that connects to the beautiful Hardangervidda, a famous broad natural area with roads, trails, waterfalls, you name it. I wasn’t going quite that far; I had picked out a nice medium 2-hour trail from the VisitTelemark walking trails website: Solstien. I would have ranked it as “easy” except that there is a little bit of elevation gain and there are some (very nice) stone stairs which might prove challenging to those with arthritic knees. The Solstien trail on Saturday was enjoyed by couples, friends, small families, larger groups that included several generations, and even a few intrepid individuals, hiking by themselves and yet not alone on the trail. As I ascended the initial road up to the beginning of the stone steps, I noticed bushes of wild raspberries along the way. It was past the prime season for raspberries, but I found a few tucked away under the leaves and they were something special indeed. Norwegian raspberries are a slightly different variety than any I’ve had in the US and they are extra-delicious. By the time I got to the stairs, I was catching up to a multi-generational group. I passed by some of the adults and children, then I began to pass the older hikers who had stopped to let the others catch up. As I walked by the grandfather, who was jovial, wearing shorts and didn’t really seem that old, he stopped me with the question (in Norwegian, having no indication that I was a foreigner), “Are you part of our family?” I can only assume that he meant, “Are you a friend of one of our family members?” but the question struck me quite deeply anyway and I suddenly wanted to be related to him and his group. I smiled and stated that, no, I was hiking alone that day. We both smiled and I went on. We caught up again later, and he came over to tell me a funny thing that his granddaughter, Anna, had told him: that you must step only on the stones (not on the dirt at all) or else you are a “pingle”. I said, “A what?” It appeared that this word was essential to understanding the joke, so it wasn’t like I could just pretend that I understood. He looked at me funny and repeated the word. I had never heard that word before and asked him what it meant, at which point he really got a strange look on his face and I knew my cover was blown. I explained who I was, where I came from and why I had a limited Norwegian vocabulary. He, in turn, switched to English and explained that the word meant “sissy”, and went on to ask a lot of kind and interested questions. His granddaughter chided him for talking to a stranger, so I introduced myself properly both to him and to her. There, no more strangers… but now a foreigner. The trail covers a beautiful wide open space at the top of the world- World’s End, according to the trail sign. There is an old WWII cannon installation area to see plus quite a view. The colors that day ranged from gray to brown with a few splashes of green, yellow, red and lichen. The Solstien trail connects with the Gvepseborg round trail and there were also hikers and mountain bikers on that one. I took my time hiking, as there was no one to complain when I stopped to make photographs or to explore parts of other trails. I am not a fast hiker, but I sure had a good time. The cold, wet wind was refreshing and I enjoyed my mountaintop walk very much. I traced my steps back home to the cabin, stopping in Rjukan for gas and a gas station specialty: boller, which are sweet cardamom rolls, mine with chocolate chips and some kind of pastry cream. Amazingly good, especially after a hike. I spent the rest of the day in my cabin, enjoying the warm haven as the weather got increasingly worse outside. By nightfall, there was pouring rain, blowing wind and several giant puddles between my cabin and the bath house. I ate dinner inside that night, packed up my bags so I could be ready to leave in the morning, and went to bed early knowing I had a bit of a drive ahead of me at sunrise. Just how spectacular that drive would be, I had no idea, yet. 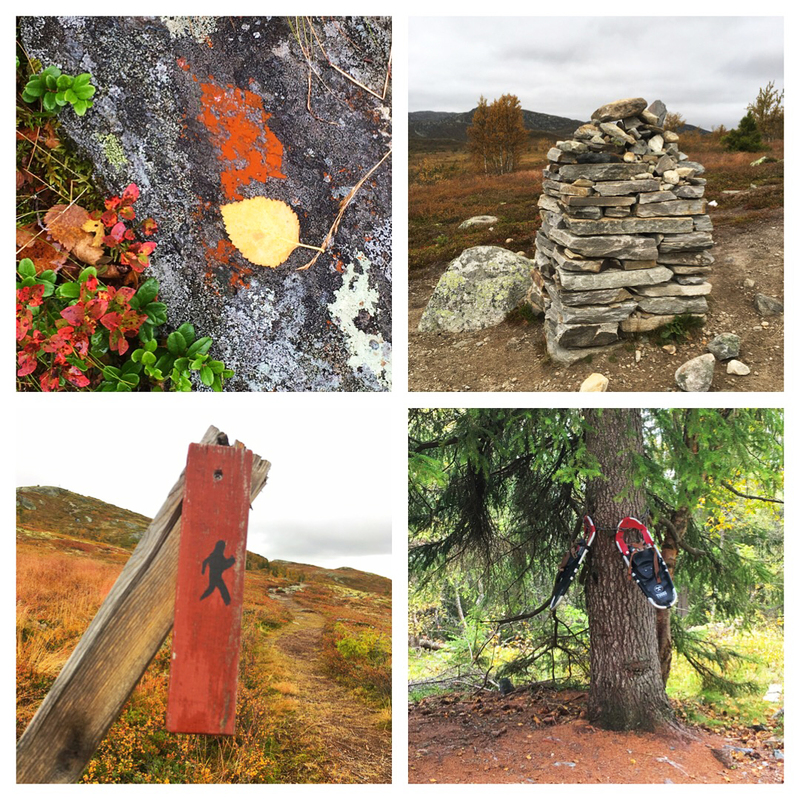 This entry was posted in Autumn, Bunad, Life, Norwegian, Photography, Travels and tagged bunad, creativity, fall, hiking, life, mom, Norge, Norway, Norwegian, outdoors, Rjukan, Scandinavia, Telemark, Tinn, Travel by Maren. Bookmark the permalink.